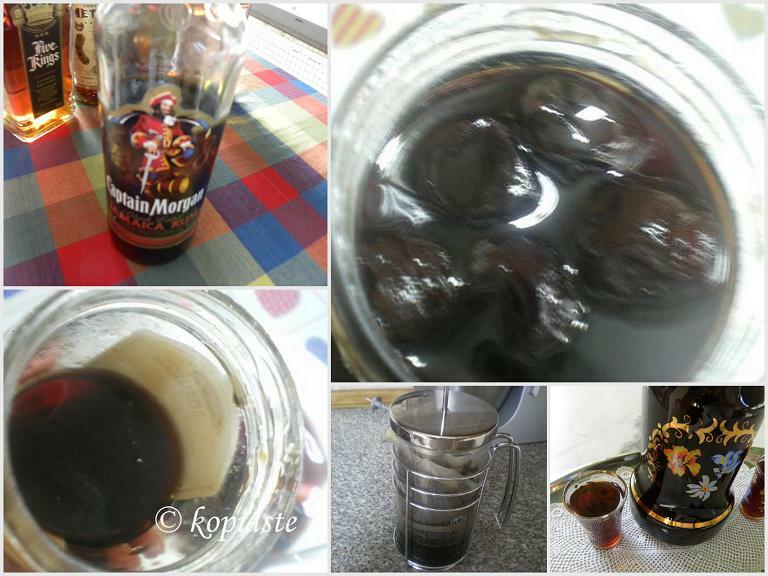 I was thinking of making a coffee liqueur with the Espresso Natalia gave me and I google searched to see how it is made. I have made liqueurs in the past so I knew the procedure but still I wanted to see if there was something more to do. I found this recipe and since I had a lot of brandies in my bar, I liked the idea of making it with brandy. I also had dark rum so I used some of that as well. I have already thought of a few ideas of using it, if it lasts until then, because we love it. I did not know it was so easy to make a liqueur! Plus I thought the liqueur had to sit for weeks before it could be consumed! Most of the liqueurs which have whole fruit or peels inside must stay for some weeks for the flavour to come out. The same would apply if I used coffee beans for making the liqueur. cheers ,ivy!metaxa is the prefered brandy of my husband…i think your creation will be mine! Ivy, that's awesome! I didn't know we could make liqueur at home! This sounds marvellous Ivy. I love your decanter – simply beautiful. Been away but I see I miss some great posts Ivy! Coffee and cherries very nice combo … I donnot drin anymore but I can imagine how nice they pair up in a liquor … I like Angie did not know making liquors was so easy either! This seems like lovely gifts for Christmas to give or share at gatherings! Very nice for a Kerasma after dinner but I hope you didn't (PLEASE) use the 7-star Metaxa! (lol) No I used the 5 Star Metaxa Brandy. Looks very elegant Ivy! Yum…great for the holidays and to serve visitors. Wow, I really like this!! Don't mind having a shot or two. Never thought of making this at home! I have made my very own version of coffee cherry brandy and it worked so well. I even used it in one of my cakes!! Thanks for sharing ! Wow!!! this sounds so interesting. Must try! Homemade Wild Cherry Liqueur is a nice combo !! We serve it at special times throughout the year with our family and friends.